Science Archives - Page 2 of 6 - Teaching Rocks! During the month of February, The Tuesday 12 will be featuring 12 FREE resources available on TPT! Click on the title of each resource to be brought to the TPT listing. You need a TeachersPayTeachers accound to download the free items. If you don’t have a TPT account, what are you waiting for?! It’s free! The description for each item is taken from the listing description on its TPT page. Don’t forget to check out the other awesome resources from these teacher sellers! “These sequencing cards are a great visual aid for children who are just beginning to learn about the life cycles of a butterfly, frog or ladybug! Simply have them color, cut and arrange the cards in the correct order. They can even make a mini book about each animal’s life cycle. “A fun science experiment where the question “Does ice melt faster in salt or fresh water?” is answered. Geared toward ages K-2nd grade. “Looking to spruce up your science curriculum, or have an AWESOME science fair project well you have come to the right place! “Young students love to act like scientists! This pack includes posters, 1/4 page cards to sequence and a generic science experiment recording sheet. “Thanks for checking out this file, Science Acrostics Freebie! I hope that these 12 pages will help your students use their higher order thinking skills to find phrases that describe each item. With an acrostic poem, you use each letter of a word as the first letter of a phrase. ~ Create a bulletin board with your acrostics. ~ Use along with a craft. ~ Use after a lab activity. ~ Use after reading the textbook or a read aloud trade book. ~ Use as partner work in a center. ~ Fold and include in science notebooks. “This FREE Trash to Treasure handout is an eight page booklet that features clever ideas, fun and engaging mini-lessons in addition to cute and easy to construct crafts made from recycled or common, everyday items. In this resource, discover how to take old, discarded materials and make them into new, useful, inexpensive products or tools for your classroom. “This is one of my favorite labs/activities that I do with my Biology I students. It doesn’t take long to do, it uses very simple, household materials, and it works every time! There is no number crunching or data analysis, but just a fun activity that your students will really enjoy. NOTE: This product is also available in a bundled product called Biology Labs: 15 Must Do Labs for a Biology Class . I have also included a “Teacher Preparation” page with answers to the questions and some additional set up information. Don’t forget to check back next week for another edition of The Tuesday 12: February Freebies! Science is one of my favourite subjects to teach. Although I love Language Arts, I really enjoy teaching math and science because students have so many opportunities to take part in fun, engaging, and educational activities that allow them to discover concepts and investigate different ideas. As Elita previously mentioned, we have created another science unit to address the Ontario science curriculum when teaching a combined grade 4/5 class. The following investigative activity is part of that unit, but it would be a great activity to use with students from grades 4-8 either as a way to introduce or review simple machines and motion. I think it will be a fun way to review some key concepts with my grade eight students before we delve into systems in action and students design, build, test, and present their own devices. In this activity, students will work in small groups to investigate both simple machines and linear movement. The activity begins as a whole class activity where simple machines are discussed, to a small group investigation. First, students will examine the car and layout of the experiment to investigate several simple machines. Next, in order to observe linear movement, the car will be allowed to travel down a ramp. Finally, students will demonstrate how changes to the mass of the cart will then affect its linear movement. We have been hard at work! Here is another great science unit for Grades 4/5. Our first unit on Habitats and Communities and Human Organ Systems was a great success. With great feedback from other teachers, we know that you find our products engaging, thorough and distinguished! We have many activities that are both engaging and active. Differentiated instruction is also key and diverse assessment methods are incorporated. We hope you find this unit useful for your classroom. Here is a preview of our Gr 4/5 Science Unit. Click on the picture above and you will be taken right to the full product! In this week’s edition of The Tuesday 12, we’ll be looking at resources focusing on the world’s water systems. I love to teach this unit to my grade 8 students because there are so many interesting and vital aspects to consider; for example, students learn about personal water conservation, the global water crisis, weather and extreme weather events, climate change, pollution, the chemistry of water, and the role water plays in economic, societal, political, and health issues. Just click on the title to be brought to each resource! The activities in this lesson plan help students to understand how much water they use on a regular basis and how that compares to other people in the world. I’ve done this activity with my students and it is an eye-opening experience for them. It really helps to put into perspective how lucky we are. 2. The United Nations. The Global Water Crisis. This site has excellent resources both for teachers and students. In addition to the teacher lessons plans, there are many interesting links for students; for instance, there is a water alert game, a quiz, various people tell their stories of water related issues (e.g. there’s a video clip of Jay-Z exploring the water crisis in Africa), and ways to help people around the world gain access to clean and safe drinking water. 3. Strauss, Rochelle. One Well: The Story of Water on Earth. Toronto: Kids Can Press Ltd, 2007. This is an absolutely gorgeous book and the content is just as good. 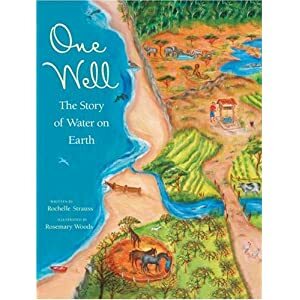 One Well: The Story of Water on Earth incorporates information of water statistics, conservation, our reliance on water, and the vital role water plays in our lives; however, the information is conveyed in a captivating manner. Throughout the book, the theme of how all the water on Earth is connected and how we are all connected to that same water is emphasized. Excellently written and beautifully illustrated! Bottled water is all around us. Unfortunately, not many people know the implications of drinking bottled water. After watching this movie, challenge your students to ban the bottle! 5. And of course, our resource to go along with “The Story of Bottled Water”! A great way to integrate media literacy and science! 6. Water 1st International. Water 1st Curriculum. During this lesson, students learn about the water cycle, their water usage, water facts, how lack of access to clean water affects people, and how they can make a difference. It also includes writing assignments, art activities, and science activities to make this lesson cross-curricular. 7. The Water Project. The Water Crisis- Lesson Plans for All Grades. A great way to bring social justice and activism into your classroom. After learning about how the global water crisis has a severe impact on many people in the world, students can work together to raise funds and awareness for various water projects. 8. Water.org. Learn About the Water Crisis. This website provides complete units on the water crisis and they are divided by grade levels: elementary, middle school, and high school level curriculum. There is an extensive amount of resources on this site and the activities are great! 9. WWF. Grade 8 Water. Schools for a Living Planet. You need to sign in to access the units on this site, but I suggest you do so, since signing up is free and the WWF has great science unit plans! This is an excellent unit plan that takes you through the chemical makeup of water, to the difference between salt water and fresh water, climate change, water conservation, and the need to protect water resources. I’ve used this site as an introduction to my water systems unit. Not only does it provide a good review of concept students have already learned, but it also gives students a great repository of information about oceans, lakes, rivers, currents, the water cycle, climate, and the chemistry of water. The contest is open to students aged 6 – 14 years old from the United States and Canada. Submissions are due March 1, 2013. I definitely want to do this with my students! This site has some great hands-on science lessons on a variety of water topics, including the water cycle, glaciers, water scarcity, streams, and evaporation! What exactly is a “concept”? According to Joseph D. Novak (1996), a concept is a “perceived regularity in events or objects designated by a label…[while] concept maps serve to show relationships between concepts, and it is from these relationships that concepts derive meaning” (p. 32). In the 1970s, Novak and his team developed the technique of building concept maps with science students, in order to link ideas, build connections, and represent knowledge. Concept maps help students better understand and organize new ideas, previous knowledge, and connections between the two. As an elementary school teacher, concept maps are used in various settings and across the curriculum. One of the benefits of being an elementary school teacher is that I teach the same group of students a variety of subjects, so some students who may not do well in science may excel in art, some who may struggle in Language Arts may blossom during science classes; as a result, it is interesting to see a student’s understanding in various subject areas. An activity that demonstrates this beautifully is the concept map. I usually introduce concept mapping as a whole group brainstorming activity; this way, students can build on ideas and make connections together. Teachers can begin by modelling what a concept map looks like and how to connect the various ideas together and then provide students with a template to fill in with words provided. This gradual release of responsibility will allow students both the experience and confidence to begin a concept map of their own from scratch. I like the idea of sharing concept maps in small groups either by having students explain their concepts and connections or by having them merge their ideas into one larger map. This type of rich activity would foster excellent reflection, discussion, and evaluation. Although concept mapping appears to be a simple activity, it is actually quite complex and difficult for some learners. According to Novak (1996), concept map can be an empowerment tool for both teachers and learners as they can use concept mapping to “facilitate meaning-making and to facilitate a sense of personal control over meaning-making for future citizens” (p. 41). This seems to be a significant benefit to using concept maps in the classroom; however, I believe that it takes a lot of time, practice, and discussion to attain such a benefit. Novak (1996) explains that “students need practice and experience in becoming skilful in concept mapping, and this requires patience on the part of both teachers and students” (p. 40). This could be problematic as teachers are constantly stressed over not having enough time to cover the curriculum expectations in the allotted time, so finding extra time to teach, model, and practice using concepts maps may not always be attainable. As I mentioned earlier, teachers must use the gradual release of responsibility model with concept mapping as it is a difficult task for students to comprehend. To me, it appears that concept maps may be difficult to students because it is so open-ended that they need some form of structure, which is why some suggest providing students with a list of terms to use in the mapping and students must determine the relationship between the words (Novak, 1996, p. 39). Novak (1996) does state, however, that although the initial experience may be daunting, students who genuinely attempted to produce a hierarchical structured concept map did so with practice (p. 35). One thing that I find problematic with concept maps is the need for evaluation. I personally do not think that concept maps should be used for evaluation, as they are meant to help a person organize their thoughts, determine their preconceptions, and allow them to make connections. I do not feel that this form of thinking should be evaluated, as it is more of a self-assessment tool to help a students understand their starting point and what they already know. I would prefer to use concepts maps at the beginning of a unit to activate prior knowledge and inform my teaching, to organize ideas learned during lessons, and throughout a unit where students keep returning to a concept map to add on more ideas and connections as they learn. Novak, J.D. (1996) Concept mapping: a tool for improving science teaching and learning. In: Treagust, D.F., R. Duit, and B.J. Fraser (Eds.) Improving teaching and learning in science and mathematics. pp. 32 – 43 London, Teachers College Press. Novak, J. D. & A. J. Cañas, The Theory Underlying Concept Maps and How to Construct Them, Technical Report IHMC CmapTools 2006-01 Rev 01-2008, Florida Institute for Human and Machine Cognition, 2008″, available at: http://cmap.ihmc.us/Publications/ResearchPapers/TheoryUnderlyingConceptMaps.pdf. Plotnik, E. Concept Mapping: A Graphical System for Understanding The Relationship between Concepts. ERIC Digest, 1998. Saskatoon Public Schools. Instructional Strategies Online. What are Concept Maps? Vanides, J., Yin, Y., Tomita, M., & Ruiz-Primo, M.A. Using Concept Maps in the Science Classroom. Science Scope, Vol 28, No. 8, Summer 2005 (p.27- 31).